We help you identify structural leads and convert these to prospects. Physical rock properties provide a quantitative connection between the interpretation of geophysical data in exploration geophysics, engineering, mining and environmental geophysics and their geological correlations. Eslan Labs Rock Property Database correlates geology with rock property data across a range of geological environments. Compiled from published data, available to clients via a web discovery. We concentrate on mass density and magnetic properties including magnetic susceptibility and remanence. Electrical conductivity and resistivity (the inverse of conductivity) depends on porosity, saturation, pore fluid conductivity, and clay content. Magnetic susceptibility gives some indication of the amount of ferromagnetic minerals, and provides insights into the structure of materials. Density, porosity, and permeability are mass properties related to pore geometry, pore-size distribution, and pore surface area. Gravity magnetic interpretation can fit different geological models, but constraints from geological data provide insights into the subsurface architecture. We place value on gravity magnetic interpretation fused with geological data with the objective of assessing depth to basement, structure and the extent of exploration lithologies. Gravity magnetic interpretation and inversion requires constraining geological data obtained from outcrop, drill hole and structural measurements. Gravity magnetic interpretation must be constrained by additional geological, tectonic and structural evidence for use in petroleum exploration. Most sediments are magnetically transparent, so gravity magnetic interpretation focuses on the basement and cover interface. 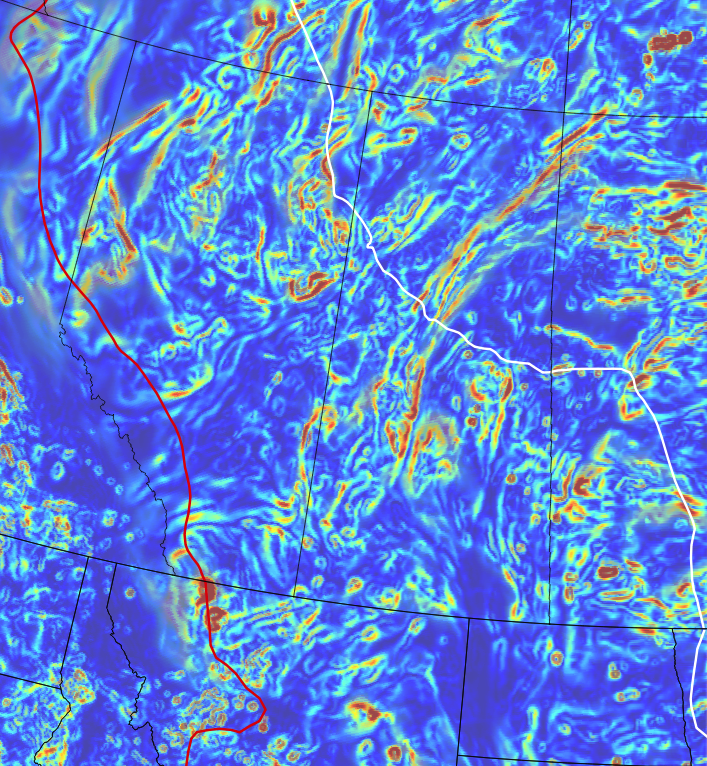 Magnetic anomalies are generated by variations in the crystalline basement whereas gravity anomalies originate from subsurface density contrasts. Gravity magnetic interpretation usingforward modeling computes the response of a geological model attributed with petrophysics data whereas inversion produces a model consistent with measured rock properties. Basins filled with sediment cause gravity lows because of the contrast between low-density sediments that fill the basin and higher density rocks that surround it. Fault zones have well-known gravity and magnetic expressions where trend, linearity, and continuity of physical boundaries are important structural and geological indicators. Tracing geological units under younger sediments from the gravity and magnetic signatures. Matching of anomalies transposed by a fault can deduce the sense and amount of displacement. Thick versus thin-skinned tectonics can be distinguished because deep crustal roots have distinctly different gravity expression from rootless mountains with thin-skinned allochthons. Geologic models can be compared to their geophysical implications. Vertical tectonics can be compared to lateral tectonic models in orogenic regions. Where the exploration basement is unclear, gravity magnetic interpretation helps develop relevant scenarios providing the building blocks to define the geology. One of the most useful inferences of gravity magnetics interpretation is the depth of crystalline basement beneath the cover. Our gravity magnetic interpretation workflow calibrates depth estimates against other sources from different potential field depth methods, from drilling and geology. This fusion workflow reveals structural boundaries that are often correlated with major basement structures. Layers between the surface and the top of basement are extrapolated from legacy well and surface geophysical data. From these exploration data a geological model, from surface to top of basement, can be derived that honors the known geological, gravity and magnetic interpretation. Our gravity magnetic interpretation is designed to gain insights into basement structure and its control on basin architecture and sedimentation patterns by deducing the size of the sedimentary basin and its subdivisions, identifying the structural framework and determining the thickness of sedimentary cover of the basement surface. Our workflow removes wavelengths > 60 km associated with deep structure, computes the tilt derivative as an edge detector to locate density variations within the crust and uppermost mantle, and calibrates these locations with independent data. The tilt derivative workflow delineates the depth and position of source bodies, without assuming knowledge of shape, and Euler deconvolution locates the boundaries. The workflow uses the complete Bouguer anomaly values, assumes crust and mantle densities of 2670 and 3150 kg m-3. The workflow uses terrain-corrected Bougier gravity anomaly inverted using iterative procedures . Gravity magnetic interpretation can be used to investigate structures important to exploration. Without making assumptions regarding layer density, crustal thickness variations are estimated by subtracting the thickness of sedimentary layers, where possible using a model constrained by seismic data. Regional interpretations of the distribution of bodies in the basement must meet at least two of the following criteria: (1) a magnetic anomaly, (2) solutions indicating faults and (3) a positive tilt derivative anomaly. Fully integrating gravity magnetic interpretation with all available data into the exploration process can find missed basement faults, and so there is an opportunity to rework old data sets using an integrated methodology in order to redefine basement architectures. Faults can be uniquely identified from gravity magnetic interpretation of anomalies because juxtaposed dissimilar rocks create contrasts in physical properties detectable in both gravity and magnetic fields. Reliably identified brittle faults and fractures have strong magnetic signatures cutting through the structural patterns. Our fault detection workflow relies on gravity magnetic interpretation of lineaments that can be ductile shear zones, metamorphic and structural linear fabrics, and structural discontinuities. The workflow uses the Total Magnetic Intensity and combines the horizontal and vertical gradients, minimizes the use of FFT filtering, enhancing anomalies only using stable, finite element functions. The workflow combines several shaded reliefs generating maps from geologically driven illumination angles in order to selectively emphasize anomalies. Gravity magnetic interpretation of fields is produced from limited data, and assumes that interpolation does not introduce artificial features. In reality, line orientation, survey line spacing, and different interpolation algorithms typically produce different results. Routine map products are not useful for specific exploration targets. Enhanced derivative interpretation of TMI over western Canada and US. Red line indicates Rocky Mountains deformation front, white line marks eastern extent of Phanerozoic cover which together indicate the transparency of sediment covering the basement fault, lineament and shear zones. We use gravity magnetic interpretation techniques designed to extract the main features in a potential field. By using multi-scale approach, these features have a rigorous relationship to contacts between zones of different density or magnetic susceptibility, and can be employed in an inversion strategy. Multi-scale edge mapping is a process of mapping edges in potential field data at a variety of spatial scales, the shape of which are a function of the 3D location of contacts between bodies of contrasting density and/or magnetic susceptibility. Such surfaces provide a powerful tool for gravity magnetic interpretation to help gain insight into the geometries of geological structures at exploration depth. Eslan Labs experts always use plate tectonics interpretations. Most useful in frontier basins for gravity magnetic interpretation, it is helpful even in mature basins. Knowing how a structural play fits into the tectonic framework can yield innovative exploration solutions. Blakely, R. J., and S. Hassanzadeh, 1981, Estimation of depth to magnetic source using maximum entropy power spectra, with application to the Peru-Chile Trench: Nazca Plate, Crustal Formation and Andean Convergence, 667–682, Geological Soc. of America Memoir154, Boulder, CO., 1981. Blakely, R.J., Sherrod, B.L., Weaver, C.S., Wells, R.E., Rohay, A.C., Barnett, E.A., and Knepprath, N.E., 2011, Connecting the Yakima fold and thrust belt to active faults in the Puget Lowland, Washington: Journal of Geophysical Research, v. 116, B07105, 33 p.
Bott, M.H.P., and Smith, R.A., 1958, The estimation of the limiting depth of gravitating bodies: Geophysical Prospecting, v. 6, no. 1, p. 1–10. Brodaric, B., Gahegan, M., and Harrap, R., 2004, The art and science of mapping—Computing geological categories from field data: Computers and Geosciences, v. 30, no. 7, p. 719–740. Cordell, L., 1994, Potential-field sounding using Euler’s homogeneity equation and Zidarov bubbling: Geophysics, v. 59, no. 6, p. 902–908. Frodeman, R., 1995, Geological reasoning—Geology as an interpretive and historical science: GSA Bulletin, v. 107, no. 8, p. 960–968. Grauch, V.J.S., and Cordell, L., 1987, Limitations of determining density or magnetic boundaries from the horizontal gradient of gravity of pseudogravity data: Geophysics, v. 52, no. 1, p. 118–121. Grauch, V.J.S., Hudson, M.R., and Minor, S.A., 2001, Aeromagnetic expression of faults that offset basin fill, Albuquerque basin, New Mexico: Geophysics, v. 66, no. 3, p. 707–720. Jachens, R.C., and Moring, B., 1990, Maps of thickness of Cenozoic deposits and the isostatic residual gravity over basement for Nevada: U.S. Geological Survey Open-File Report 90-404, scale 1:1,000,000. Jaques, A.L., Wellman, P., Whitaker, A., and Wyborn, D., 1997, High-resolution geophysics in modern geological mapping: AGSO Journal of Australian Geology & Geophysics, v. 17, p. 159–173. Jones, R.R., McCaffrey, K.J.W., Wilson, R.W., and Holdsworth, R.E., 2004, Digital field data acquisition—Towards increased quantification of uncertainty during geological mapping: Geological Society [London] Special Publication 239, p. 43–56. Lillie, R.J., 1999, Whole Earth Geophysics—An Introductory Textbook for Geologists and Geophysicists: Upper Saddle River, New Jersey, Prentice Hall, 361 p.
Nabighian, M.N., and Hansen, R.O., 2001, Unification of Euler and Werner deconvolution in three dimensions via the generalized Hilbert transform: Geophysics, v. 66, no. 6, p. 1805–1810. Nettleton, L.L, 1971, Elementary gravity and magnetics for geologists and seismologists: Society of Exploration Geophysicists, 131 p.
Peters, L.J., 1949, The direct approach to magnetic interpretation and its practical application: Geophysics, v. 14, no. 3, p. 290. Reid, A.B., Allsop, J.M., Granser, H., Millett, A.J., and Somerton, I.W., 1990, Magnetic interpretation in three dimensions using Euler deconvolution: Geophysics, v. 55, no. 1, p. 80–91. Salem, A., Williams, S., Fairhead, D., Smith, R., and Ravat, D., 2008, Interpretation of magnetic data using tilt-angle derivatives: Geophysics, v. 73, no. 1, p. L1–L10. Smith, R.A., 1961, A uniqueness theorem concerning gravity fields: Proceedings of the Cambridge Philosophical Society, v. 57, p. 865-870. Vine, F.J., and Matthews, D.H., 1963, Magnetic anomalies over oceanic ridges: Nature, v. 199, no. 4897, p. 947–949.